We at West Coast Authentic (WCA) are proud to bring to you our new and improved website to showcase one of the most extensive and original inventories of sports photos and autographed memorabilia for you to add to your collections. Here at WCA our mission is to help bring your collection to new heights and to make your collecting experience as fun as it was when you were a youth! Get your children involved! The future of true collecting is in need of nurturing. Feel free to browse our categories for not only sports but celebrity items that come with our money back guarantee. Looking for a gift and not sure where to start? Search your special person´s favorite player or contact us. Enjoy the site and check back often as new items are being added daily. Also feel free to let us know what future items you would like to see at WCA. We are committed to our customers’ satisfaction. This hobby has been around for years and may have grown more than any other in the world. But with popularity and the high demand comes the people that want to make a quick buck and sell fakes. Autographs can be the finest hobby in the world but also the hardest to trust. West Coast Authentic not only wants to help you acquire the pieces you are looking for, we want to educate new collectors and get more people involved. We like nothing more than to see the excitement as a child gets an autograph in person. That is what makes the hobby fun. Media and auction sites such as eBay have brought a lot of attention and new collectors/dealers to the hobby - both good and bad. When looking at pricing of autographs there are a couple things to keep in mind. For instance, do you really think you can buy an authentic autograph of Michael Jordan or tiger woods for 20 bucks? NO. Unfortunately, if you want real autos you cannot get them for $20. Learn the players habits. If a player signs exclusively for a company like UDA and their autograph sells for $1000, when someone offers you one for $20, run away. Be careful of dealers that have lots of stock of hard to get players. Or when you ask a dealer if he has a tiger woods autograph and he says "hell ya, I have 50." -You may want to think twice!. We doubt there are as many fakes out there as people report. Hockey autograph collecting is the best by far as players are very easy to meet and talk to. Below is a list of autograph types in order from top to bottom, easiest to most difficult to obtain autographs. Celebrities - the hardest to obtain and many do not do sit down autograph signings. So if you are looking for that special photo, ball, or jersey to get signed, drop us a line. Our staff would be more then willing to help! Whether you are a new collector of autographs or a pro, here is a bit of info from us at West Coast Authentic. There are 6 ways of obtaining that prized autograph. Personal correspondence with the player or individual: Easier said than done. While most of the greats are deceased i.e. Babe Ruth, Maurice Richard etc, some players are very willing to sign for you through the mail. IT TAKES TIME but you may see some great players, Hall-of-Famers etc. I have waited up to 5 years to get a response from some players through the mail so be patient. It does not hurt to add a few $ for their time as some sign for charity. Direct requests to the individual: You can't beat meeting your favourite in person. This could be a great experience or may turn you against the player. A couple things to remember: don't interrupt while he/she is eating and don't ask for 10 autos at once. In our expierience, if you ask to have it personalized you will get a better response and a nicer autograph. Hockey players seem to be the easiest players to access but with work you can find the player you seek. Purchasing from a dealer: There are tons of autograph dealers and promoters out there. Some are great and some are fake. Always do your homework on the auto you are seeking. Make sure they offer a 100% money back guarantee. It's pricey but you can get some of the tough autos you seek. Auction: You can find many items at auctions. You just never know what you will find at local auctions and many sports/celeb auctions around the world. Antique dealers and pawn shops: Yes, these are great places to find treasures. I once purchased a Babe Ruth baseball from a pawn shop. Do your homework and go have some fun. Trading: This has been around for years. Trading allows both parties to get something they need or want for their collection. Its fun and you can learn a lot. Jason Bobbitt, owner of West Coast Authentic, has been in the sports memorabilia business for over 20 years. Jason has built the company into a leading wholesale producer in the autograph market not only in Canada but in the US, Brazil, UK and Japan. Jason Bobbitt's reputation in the autograph business recently caught the eye of the UFC and now has exclusive contracts with dozens of MMA fighters all over the world and handles all aspects of each fighter's autographed items, autograph sessions and appearances. Jason Bobbitt began his business focusing primarily on Hockey memorabilia. West Coast Authentic has hosted hundreds of private autograph sessions with current and former NHL players including Hall of Famers. Private signings are West Coast Authentic's method of choice when obtaining truly authentic autographs. Jason finds that the most rewarding part about having created West Coast Authentic is the amount of money that is donated to charities through his efforts at fundraising events. Each year hundreds of thousands of dollars are donated through auctions hosted by West Coast Authentic. Jason Bobbitt is very active with junior hockey and supports local teams. 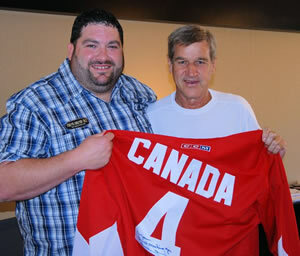 Recently Jason was chosen by Hockey Canada to host silent auctions at the 2012 World Junior Hockey Championships in two different cities. The funds generated from the auctions help ensure that our country remains at the forefront in the development and promotion of amateur hockey. At West Coast Authentic we have been buying and selling autographs for over 18 years. We deal with some of the best players out there. We acquire most of our autographs from personal signings, in-person dealings with the players/celebrities, or purchases from reputable dealers. We offer great autos and not just in person autos. Trust us, there is a big difference from a sit-down signing where the players get paid for their autograph and meeting them running to the bus. Lots of players/celebrities know that people are only asking for autos to sell and they don't appreciate it. When you pay, you have a contract and everyone wins. We offer a 100% money back guarantee on every item we sell. It is not only a business for us, we enjoy helping you get that piece you have sought after for so long. What can we do for you? Whether you are looking for a birthday gift, holiday gift, something for your den, or even if you have a sports bar that's needs that special touch - we can do it. West Coast Authentic has set up over 20 offices/dens, 3 sports bars and have made many individuals very happy with their collections. Please take a look around and feel free to ask questions. If you are looking for anything in particular drop us a line. With many of our players we can have the autograph personalized to your specifications (ie. Happy birthday, best wishes etc.) Newer players are tougher, but some can be done. However, the greats of the game such as Bower, Beliveau etc are not a problem. A COA is the seller's guarantee to the authenticity of their product. Should you buy an autograph just because it has a COA? NO. COA's (certificates of authenticity) these days can be meaningless. Anyone with a printer can print off their own certificate and sell it with any item they buy at their local market. Be sure the certificate offers a guarantee and ask questions about the guarantees. Here at West Coast Authentic we have spent a lot of time and money on our certificates. We have matching numbered hologram stickers that go on the product and certificate itself. This insures that the item accompanying the certificate is the actual item inspected by West Coast Authentic and therefore covered by our guarantee. It is difficult for buyers to be sure that the certificate that accompany their purchases are those originally inspected by the certificate issuer without matching stickers especially if those items and certificates have exchanged many hands. Here at West Coast Authentic you can enter your certificate # at the top of this page, and you can verify that the item is in our database. ALWAYS ASK QUESTIONS, LOOK AT THE AUTO AND DO YOUR HOMEWORK.